European Digital Rights (EDRi) pointed out earlier that the vote for Europe’s notorious copyright directive is set to take place tomorrow. With so many opposed to the legislation, it is probably bound to happen that tempers would begin to flair up. Earlier, we reported how lobbyists pushing for Internet censorship accused free speech proponents of carrying out what they claim is a “misinformation” campaign. 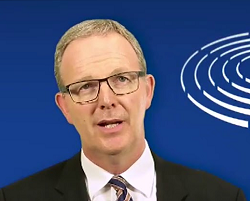 Earlier this month, the architect of the Censorship machine law, Axel Voss, hurled accusations at free speech proponents by accusing them of lying. Later on, Voss admitted that the law is about upload filters after all. He then doubled down and suggested that websites like YouTube shouldn’t exist. Obviously, Voss is no stranger to making controversial remarks. Recently, however, it seems that Voss is making even more controversial statements. In an article to Voss friendly publication Spiegel, Voss made even more accusations (German, English translation) (Caution: may be subscribe walled). In the article, Voss said that he is collecting e-mails from critics of censorship and handing them over to authorities for potential prosecution. He claims that some of them contain personal attacks and bomb threats to him and his staff. The publication then went on to try and paint Voss as a kind and gentle person as well. At a press conference in Berlin, @AxelVossMdEP confirmed rumours that some press publishers have threatened parliamentarians with bad election coverage if they vote against the #copyright reform. Voss does not consider this problematic. All this is happening days after mass demonstrations took place all across Europe to put a stop to the legislation. This after an online petition against the legislation hit 5 million signatures. As of this writing, the change.org petition has collected 5,148,345 signatures. That after major European websites took part in a massive blackout protest campaign. With so much pressure from the people, politicians are finding themselves having second thoughts on supporting the legislation. With that much happening, it probably shouldn’t come as a surprise that tensions are beginning to boil over at this point. With the vote happening tomorrow, it’s actually very unlikely the debate will end after the vote results have been made public. If the directive goes down in flames, lobbyists will likely cry foul and demand the legislation be brought back. Chances are, that will happen after elections take place. On the other hand, if the legislation is passed, it still has to clear one last vote next month. That means pressure will continue to remain high from those who support online free speech. This is because, at that point, it’ll be do or die for the future of the Internet. So, nothing will be left to chance at that stage. In light of everything, tensions are likely to continue to remain high for the next little while.